It is a car holder(air vent mount), also a wireless charger. The wireless car charger holder automatically open its arms when your mobile phone is getting close, then hold it tightly and starts charging. Intelligent. It knows how to welcome and energize your mobile phone, makes you a worry-free driver. • A Qi wireless receiver adapter is needed if there is no native Qi wireless charging module inside your phone. If you choose ours, please mark your phone model. iPhone 8 and later support wireless charging natively. Most hot Android phones also support. Check the list here. 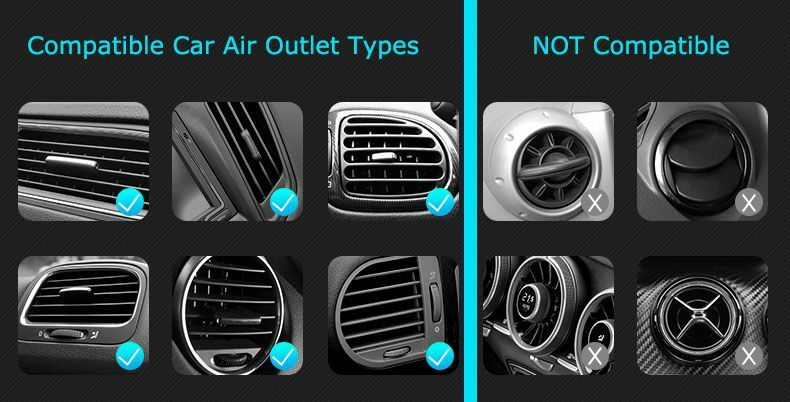 • Check the base stand if you want to mount it elsewhere other than the air vent outlet. • Creative industrial design. Combines the car phone holder and the wireless charger into one. • Intelligent. Auto holds/release your mobile phone with its IR sensor and touch sensor. • More convenient and less distraction. Mounted on the air vent, easier for one hand operation. • The mount is compatible with almost all cell phones(4-inch to 6.5-inch). • Wireless charging function is compatible with all mobile phones. A Qi wireless receiver adapter is needed if there is no native Qi wireless charging module inside your phone. • Soft silicone pad protects your phone. Check the base stand if you want to mount it elsewhere other than the air vent outlet. The list is not complete. If your phone is not listed above, please refer to your mobile phone manual to check if it natively supports wireless charging or not.